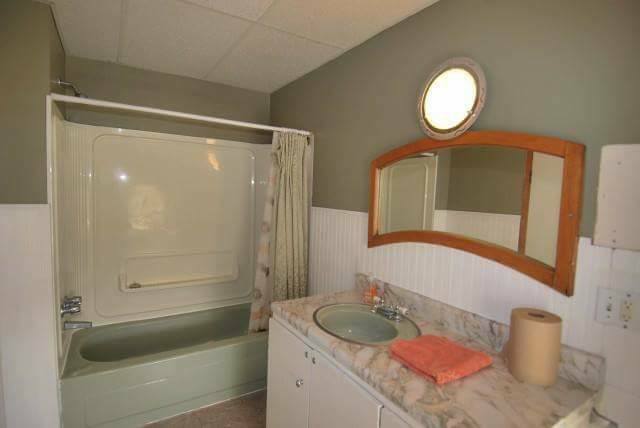 One of my favorite rooms in my house is the downstairs bathroom, it's the one where the tub is. The one where I spend my lonely nights relaxing after a long day of work, family life, cleaning, some times renovating, too. I love laying back and enjoying a nice hot (very hot) bath. 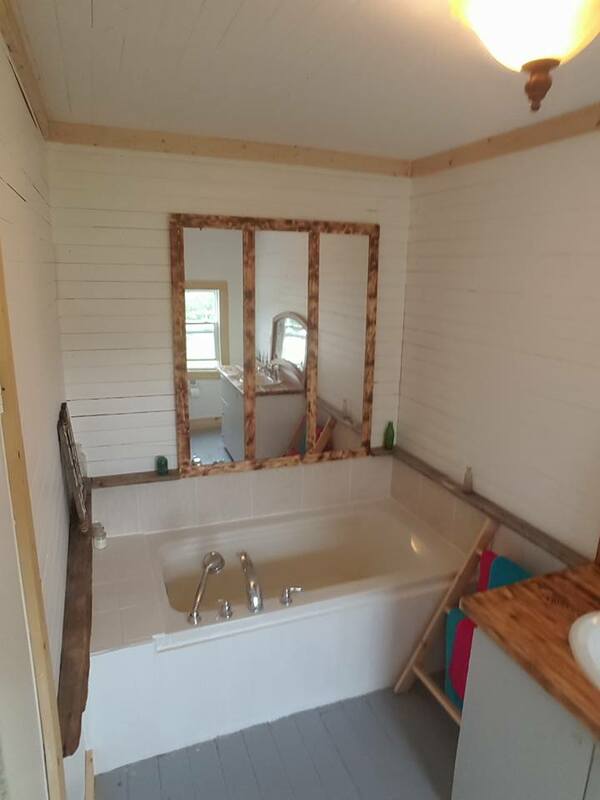 Sadly when we bought our house there was a very shallow tub that wasn't good for soaking. It just had to go. We found this wonderful tub that you can soak in and get wet, like everything gets wet. It's so relaxing and comfortable. No more sloshing back and forth from side to side trying to get the top covered and keep the sides warm. Bathtubs are not always friendly after you age a bit. I took out the ugly green tub, which was rotting by the way, and I replaced it with the most fabulous tub. 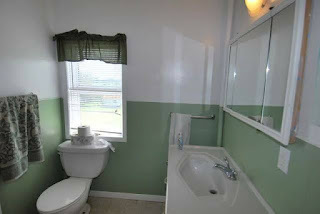 Changed the lights, the sink, counter top and toilet. I removed the walls to expose the original wood wall and took away the drop ceiling and removed the three layers of vinyl flooring. I love the end result. I find my new bathroom to be very relaxing. Then we move upstairs. The ugly green continues.... Just reversed? We removed the very small shower stall that I could not use comfortably at all. 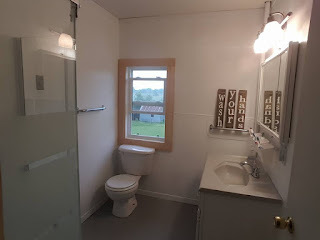 I don't even think my husband ever used it in the short time he lived with us here but we installed a new glass corner shower, opening up the room a great deal. It feels so much larger now. We also swapped out the toilet and all faucets and lighting just like we did downstairs, gave it a beautiful white paint job and we are left with a very lovely three piece bath upstairs, as well. I really love the improvements that we've made in this house. I hope that the people who buy it enjoy it as well. If it wasn't for being posted across the country we definitely would not be selling this house. But, as with this lifestyle, the winds of change have blown this way and we've adjusted our sails to head East and enjoy a little coastal life for a few years. I promise that Payette Custom Creations will be opening up for business again in the very near future. We are just 2 weeks away from moving into our new house. So, as long as everything goes our way we will be ready to start taking and making orders by the beginning of September. After we arrive and are all unpacked I will do inventory and set up the webstore again. In the meantime stay tuned to our blog and I will be sharing another exciting room transformation soon... Which room would you like to hear about next?